R. Pringle ( Scotland ) Ltd. is a long-established family run business. Established in 1898 by Robert Pringle, the Great Grandfather of the present Managing Director. 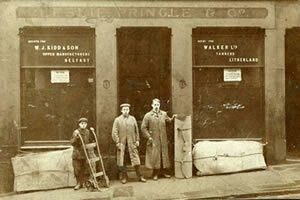 Robert Pringle, along with a Mr. Leslie, began a company supplying to the shoe repair trade - Leslie, Pringle & Co. Ltd., Leather Factors & Merchants, Edinburgh & Glasgow. Robert Pringle’s son, Robert Johnstone Pringle, followed in his father’s footsteps into the family business and in 1966 left to set up his own manufacturing company at 54 Arrotshole Road, College Milton North, East Kilbride trading as Robert Pringle (Leatherworks) Ltd.
His other son Leslie Pringle entered the family business and continued on under the name Leslie, Pringle & Co. Ltd. and built up the business to become the premier leather company in Scotland . They produced a magazine named “L.P. Weekly” and then when the Company was incorporated with Dougal Cameron Ltd. at 352 Leith Walk, Edinburgh “The Cameronian” bearing the legend – Mingle with Pringle and Hammer on with Cameron ! In 1983 Ewan R. Preston , grandson of Robert J. Pringle, was appointed Director of Robert Pringle (Leatherworks) Ltd. In 1988 Robert J. Pringle, resigned as Director of the company leaving Ewan R. Preston in charge. In January, 1990 the company changed it’s name to R. Pringle (Scotland) Ltd. and on 23rd October, 1995 they moved to larger premises at their present address 55-57 James Watt Place, College Milton North, East Kilbride.